Curtis Cray, also known as MC Clip, is a character in the HD Universe who appears as a minor character in Grand Theft Auto V. He is voiced by J. Wells. 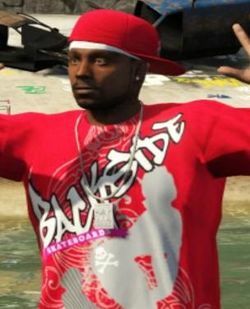 Curtis Cray, referred to as MC Clip, is a famous rapper based in Los Santos who appears to be criticized for being a "fake" rapper, as described by Tavell Clinton. MC Clip is mentioned on the cover of West Coast Classics Magazine, as he was recently interviewed by them. He states that he intends on stopping war, and recalls his recent three hour concert in Los Santos. He begins shooting a music video in the Los Santos Canal with many bikini-clad women when Franklin Clinton, Lamar Davis and Trevor Philips interrupt the video by stealing three Seasharks. The player can kill MC Clip but he will survive despite a Weazel News update, as he bleets about the incident. After completing Hood Safari, Weazel News will announce that MC Clip was killed in the firefight between the The Families and the Ballas, even if the player chose not to kill him. Despite this, he still posts on Bleeter, complaining of "hoods" stealing his Seasharks. If Franklin visits the Ammu-Nation store in Sandy Shores, Melvin tells Franklin that he loves MC Clip. This page was last modified on 4 March 2017, at 13:35.